Michelle Schwengel Regala's Hook The Reef project incorporated crocheted contributions from hundreds of volunteers. Much of the artwork Michelle Schwengel-Regala's created aboard the R/V Falkor involved codes, and covering everyday items in yarn art. 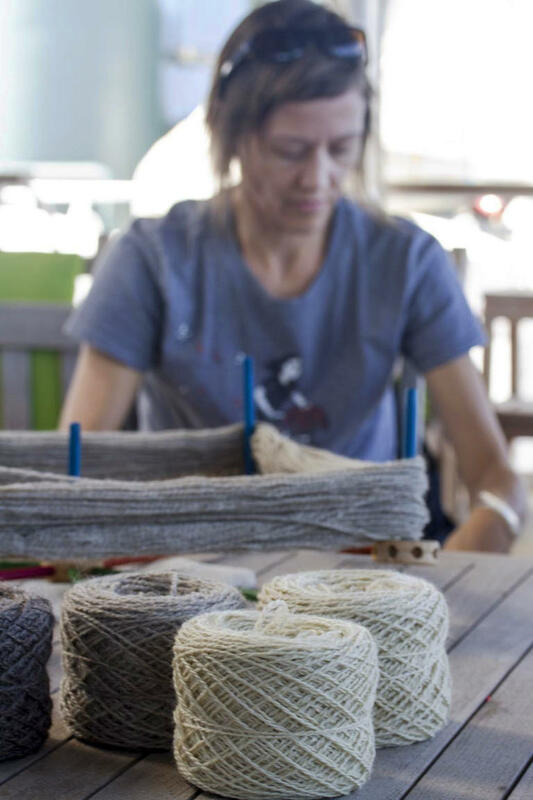 When scientists recently headed to the tropical Pacific Ocean to investigate microbes who live without light or oxygen, they had an unusual companion: Michelle Schwengel-Regala, a fiber artist who knits and crochets interpretations of science and nature. Schwengel-Regala was taking advantage of Schmidt Ocean Institute's Artist-at-Sea program. And, while artists going to sea with scientists may sound like a new idea, Schwengel-Regala says she felt connected to 18-century artist-naturalists, like botanical illustrator Sydney Parkinson, who were important members of voyages of discovery. "There's a long history of art and science going together during voyages or expeditions," says Schwengel-Regala. "It was nice to see it coming back around this way in a modern time." Fiber artist Michelle Schwengel-Regala at work aboard the R/V Falkor. Schwengel-Regala says it's important to develop a connection between the public and science, and that creative expression - writing, video, fine art - has a big role to play in that. "These are important components to be able to connect the public to science, and to biology, and to conservation, and to the state of the world," says Schwengel-Regala. Mak Saito, an associate scientist in Marine Chemistry & Geochemistry at Woods Hole Oceanographic Institution, agrees. Saito studies the metabolic processes of ocean microbes, and how these tiny organisms drive global cycling of elements, like carbon, nitrogen, and oxygen. Saito was chief scientist on the recent tropical Pacific cruise, the goal of which was to get a handle on how differently life functions in parts of the ocean where there is little to no oxygen. Oxygen deficient zones, as they are known, are expanding as a result of rising ocean temperatures and nutrient run-off from land. That, in turn, has ramifications for all life on Earth, since ocean microbes are the source of half the oxygen in the atmosphere. But it can be hard to get non-scientists excited about water chemistry and microscopic organisms. "We know what we study is visually difficult for the general public to grasp and understand," Saito says. "But we also know it's very important for people to understand what we call biogeochemistry, because it's essential to understanding climate change." Michelle Schwengel-Regala knitted swatches and then embroidered graphs of oxygen and other water quality data. Saito says Schwengel-Regala did an impressive job of capturing interesting and important features of the data researchers collected. But it's not just the facts and figures that he hopes comes through in Schwengel-Regala's artwork. He says that the creativity of science is widely under-appreciated. "There's a natural synergy between science and art that sometimes isn't recognized when we're going through the motions of teaching students the rigor of science," he explains. "Coupled with that there can be a lot of creativity in terms of trying to figure out what to study and trying to find a way to let nature speak to us and be able to tell its stories." While Schwengel-Regala had a lot of work to do getting up to speed on the scientific aspects of the cruise, she says that seeing scientists at work in this setting was hugely influential. Seeing their curiosity and passion for science in action, but also their humanity - from sea-sickness to the simple need to not talk about science for a while - changed how she thinks about her work. In the future, she says, she'll be looking for more opportunities to get out of a traditional studio setting and work with more scientists.